“Rama’s Kitchen” is a unique restaurant in the Judean Hills that is open to the public on weekends only. Over the years Rama’s Kitchen has become a thriving culinary landmark and is consistently ranked as one of Israel’s leading restaurants. The menu constitutes a confluence of contemporary western cooking techniques and traditional Arab and Mediterranean cuisine that is characterized by simplicity and earthiness. Only open on weekends, only serving the freshest ingredients, and refusing to offer anything but the most magical dining experiencing, Magda serves a fusion of Jewish and Arab cooking from a husband and wife team who share their dream of peace in the form of delicious cooking. The restaurant serves locally sourced, seasonal food which is famous for showcasing unique aspects of Levantine cooking. Arcadia's cuisine offers a truly local dining experience. Chef Kedem composes an ever-changing culinary expression of the local terroir in his own unique style and with meticulous attention to detail. His restaurant has helped define the rapidly evolving new Israeli cuisine and has a rich reputation hosting world leaders, statesmen, diplomats and world-renowned chefs. 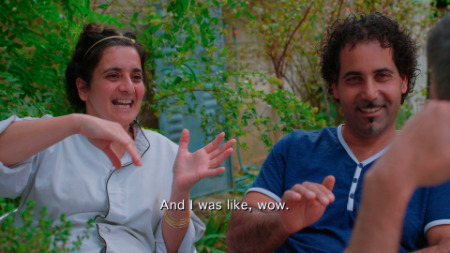 Chef Kedem shows us his famous Eggplant Carpaccio in the film - a dish that starts by burning an eggplant. 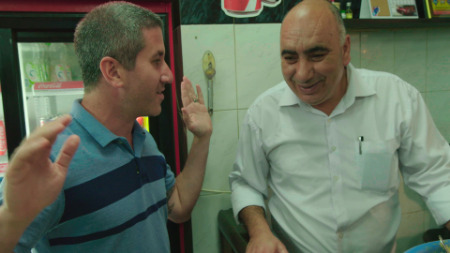 While it seemed strange 15 years ago, now it's served across Israel by lead chefs. The general concept of hachapuri (hacha means cheese, and puri means dough) comes from Georgia, but it differs in taste and in style from region to region. This bakery offers a classic hachapuri, an acharuli--filled with cheese and topped with a fried egg--and a magaruli--yeast dough with a layer of cheese on top, crisped in the oven. The proprietor, Tango, noticed that Israelis had embraced Turkish burekas and decided to enrich the city’s culinary offerings with the amazing taste of Georgian burekas. Hachapuria makes these pastries fresh, without margarine, just like Tango’s mom has been making them for years. A famous hummus spot which is a favorite among Jerusalem Israelis. Simple, delicate hummus topped with pine nuts or ful (fava beans) the hummus here has been made the same way for decades and is an enduring landmark in Jerusalem's Old City. As Mike said "It's hard to argue with that." The Iraqi Market in Machane Yehuda Market. A legendary Kosher restaurant near Mahane Yehuda market with a variety of Kurdish, Iraqi and Sephardic dishes friendly to any budget. Possibly most famous for their eggplant with ground beef, they also serve excellent kubeh soups. Time was, Jerusalem wasn't seen as a foodie town. Times have changed. People from across the Middle East come to experience Chakra, an eclectic and hip restaurant in Jerusalem, with a menu that changes every few months and a party-like atmosphere. Always serving the latest in Israeli cuisine. Chef Ilan Garousi serves food that is considered to be among the best in Jerusalem. Reservations recommended. The “original” market restaurant in Jerusalem’s Mahane Yehuda market, Cafe Mizrachi has been serving fresh, locally sourced lunch and coffee to the market crowd since 2002. Father and daughter manage the cafe together, with the goal of keeping the restaurant interesting and seasonal. Noat is a quiet goat farm near Kibbuz Sde Boker. You can rent a room to stay a peaceful night in the Negev desert at the farm. Their artisinal goat cheese is available for purchase. Hadas Meir left her marketing career seven years ago to move to the desert and bake bread. In Mitzpe Ramon, she has a spiritual relationship with baking. Her passion shows in the flavor of her incredible breads. Hadas teaches bread baking courses to visitors, which should be arranged in advance. The Ofaimme Farm was founded by brothers Yinon and Hedai Offaim. The farm grows livestock, fruit, and vegetables in order to maintain a diversity of species that promotes the ecological tapestry in which we live. In the organic pen alpine goats are raised for their milk; in the henhouse free range chickens provide eggs, and in the fields and orchards grow dates of various varieties, mango, vegetables, and herbs. The Ofaimme farm processes their crops slowly, by hand, and using traditional methods without to create food pesticides, preservatives, hormones, or genetic engineering. The products of the farm are all sold locally and are sown and reaped, reared and milked, harvested and picked with the help of workers and volunteers from around the globe who enjoy creating healthy, fair, and delicious food. The Renanim Center, Maccabim, Modi’in. The store sells all of the farm produce along with light meals and fresh organic coffee and tea. 17 Beit Hakerem St., Jerusalem. A farm store alongside a beautiful coffee house and vegetarian restaurant that serves food and drinks from the farm’s produce. The farm in the Arava, Moshav Idan. In this location they host organized group tours of the farm as well as meals and events. The farm in the Ella Valley, Moshav Zafrirm. Here they host cooking workshops, meals, lessons and lectures on sustainable agriculture and slow food in Israel. Location in Jerusalem to be opened in April 2016. Tabor Winery is one of Israel's most prominent wine producers. The Winery is located at the foot of the historical Mt. Tabor in the Lower Galilee where it aims to capture the essence of the fruit and create a wine for every mood! We offer tours and tastings to visitors that need to be coordinated in advance with the visitor's center. The winery is open Sun-Thur 9:00 - 16:00 Fri: 9:00 - 16:00. For all inquiries about Tabor wines outside of Israel please contact the winery. Incredibly fresh seafood cooked by fisherman, chef, hotelier, and local legend Uri Jeremias. Not only does Uri get his seafood fresh from the port every day - he knows all the tricks to get the absolute freshest fish. His unique and flavorful cooking has kept the restaurant thriving for over 20 years. Considered the best restaurant in Akko by some, and the best seafood restaurant on the Mediterranean by others, Uri Buri is tucked into a 400 year old Ottoman building in the old city of Akko. At his higher-altitude vineyard in the Golan Heights, Tal Pelter grows boutique wines comparable to the best in the world. The northern geographical location creates ideal ripening conditions - snowy winters, late onset of spring (April), long ripening at relatively low summer temperatures, day/night temperature differentials and high levels of sun radiation. It's a small winery, very intimate. Tours are available, please coordinate your visit in advance by phone or email. For those unable to visit the winery, Pelter Wines are available across the world and represent the best of Israel's growing boutique wine scene. Al Arz Tahini was founded in 1992 as a small Christian Arab family business in Nazareth, Israel. The company was founded by Assad Zaher. His wife Julie and daughter Lana took over the family business after his passing and continue to win awards and praise from both chefs and home cooks for the flavor of their tahini. They start with the best quality sesame seeds and work to preserve the sweetness and aroma of the sesame seeds without using chemical processes. You can buy their Tahini anywhere in Israel, or online for international distribution. Habait Be'Ein Hud in the hills outside Haifa, serves authentic home-style Arabic food without a set menu, serving whatever is fresh and in season. Mohammed Mubarak and his entire village come together to serve generous portions of tasty food with a lovely view. Food lovers in the know think this may be the best Palestinian food in Israel. Be sure to arrive in time for sunset. Reservations are a must!